Pen barrels manufactured from corn plastic, corn starch and vegetable derivative bioplastic make sense. These eco-pens are made from renewable materials and biodegrade. 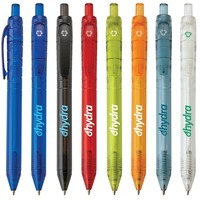 Biodegradable pens make great trade show handouts and are perfect for any environmental promotion. Visit our main website to view over 200 more biodegradable pens.